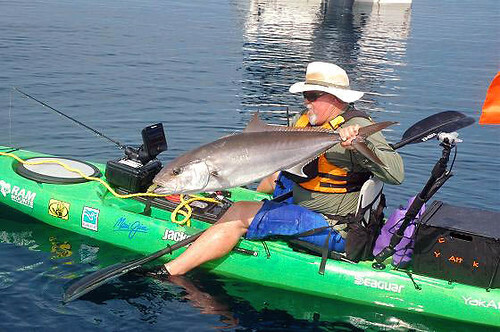 We have just returned from a great trip of kayak fishing on the beautiful Crystal Coast in North Carolina. This was my first visit to this area and I really enjoyed it. 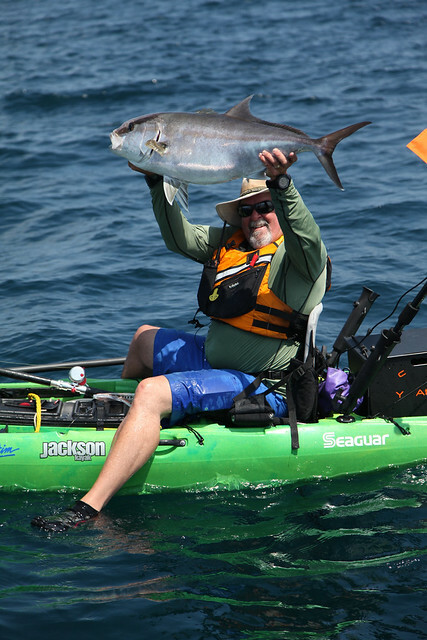 Besides the kayak fishing there is so much to do there, inshore and offshore fishing and miles of awesome beaches to explore. 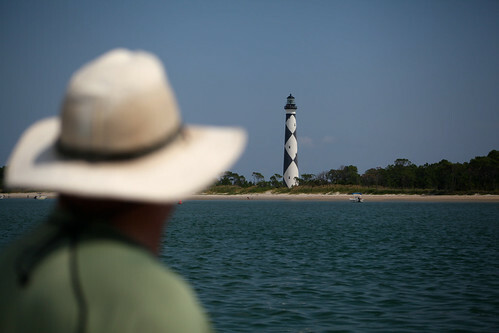 You may even run into some of the wild horses that roam the area, climb to the top of the Cape Lookout lighthouse and you can see for miles. 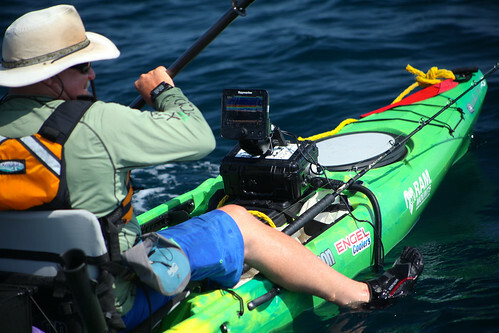 Joining me on the trip were Brooks Beatty from Jackson Kayaks and Bobby Brewer, a local and fan of our show who helped put the entire trip together. 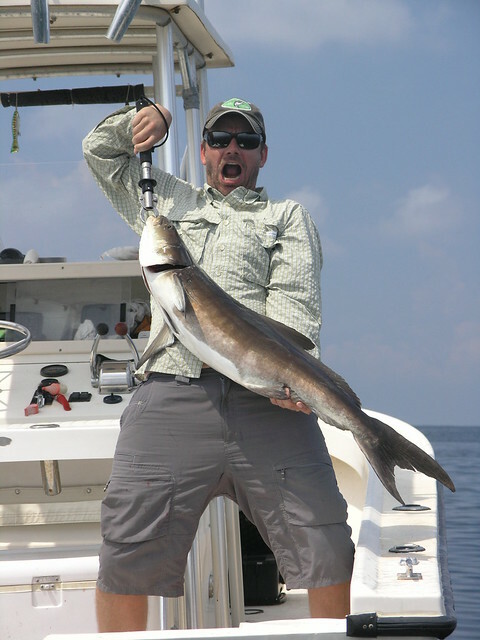 Bobby also hooked us up with Captain Joe Shute of Fish Finder Charters as our guide for the week. The name of his business is spot on because he really found us some good fish. 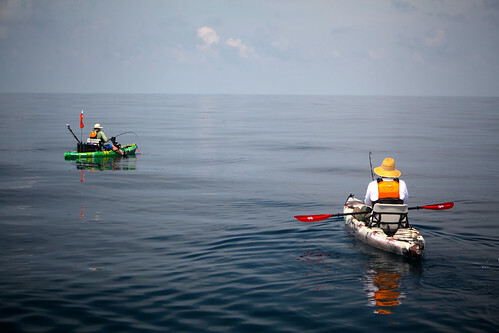 The area we fished is seventeen miles from the launch so we were not going to paddle out so we loaded our kayaks onto Joes boat and made the run out to a WWII wreck that was known to hold Amber Jack. First job in the morning was to load up on bait, which Joe did with a Cast net in a single throw, Then we made the run off the beach. 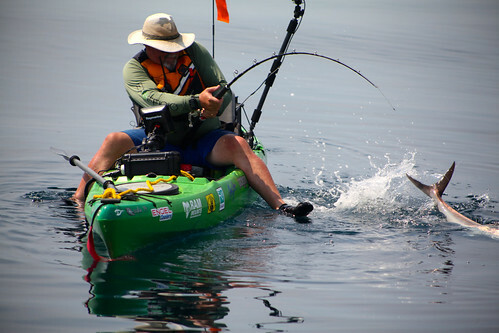 Once on location the plan was to troll live bait from the kayaks around the wreck. 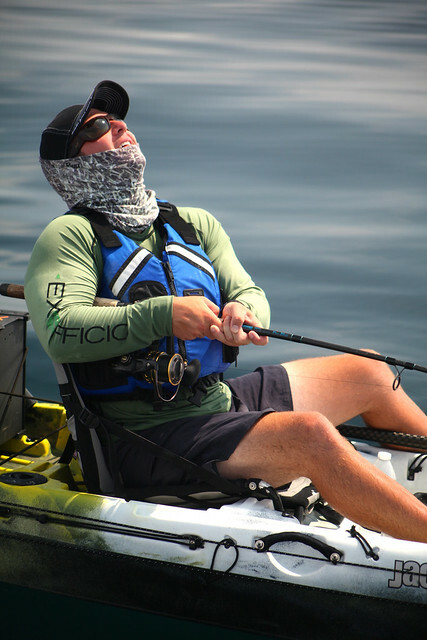 With the strong current using my Raymarine Dragonfly fish finder really helped me stay on the right spot. It didn’t take long for my first hookup and the joy of pulling on these real hard pulling fish. The wreck was in less than sixty feet of water and these fish love to run into structure so you had to fish heavy line and very tight drags to keep them out of the wreck. This worked much of the time but just as often even with my thumb on the spool I couldn’t keep the fish from breaking me off. Just before the trip I received a couple new reels from Release reels and I was very happy with their performance on these tough fish, smooth drags and plenty of power is key and these reels had both. 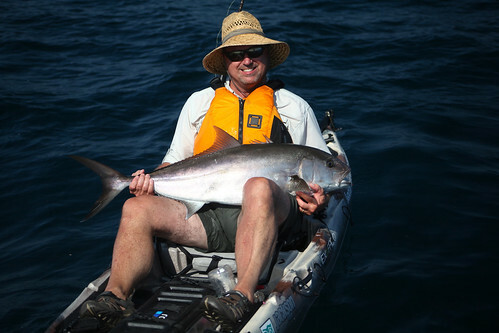 I love using knotless connections so I loaded my reels with sixty pound Seaguar Threadlock hollow core braid and used a short top shot of Seaguar Fluorocarbon fifty pound leader. 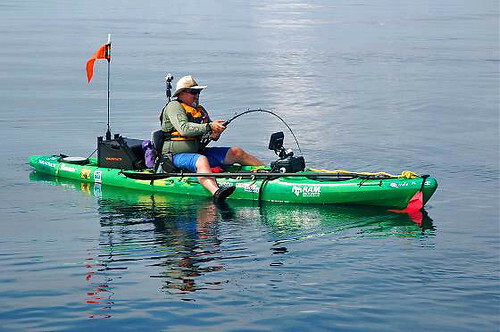 I think the coolest thing for me was getting to see Bobby and Brooks get their first big fish ever from a kayak, they really learned how hard these fish can pull and can really make your arms ache. 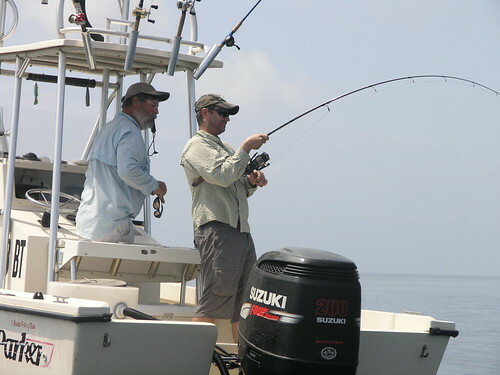 We had many double hookups and caught fish until our arms burned and we were out of bait. I was also pretty pleased to see how well my new Shark Shield worked. 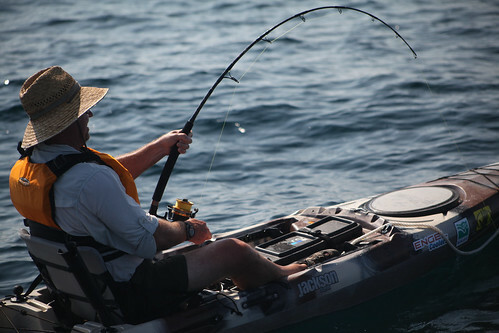 On two occasions on the trip I was able to test it out and see first hand that it does indeed deter sharks. 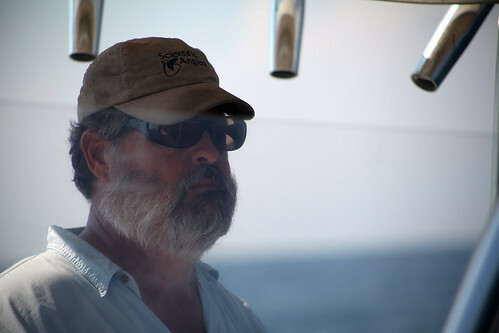 First I had a small Tiger shark cruise right up to me I turned on the Shark shield and the shark immediately turned and swam away, on the next occasion I was reeling in a fish and saw a shark following it, again I turned it on and off went the shark. 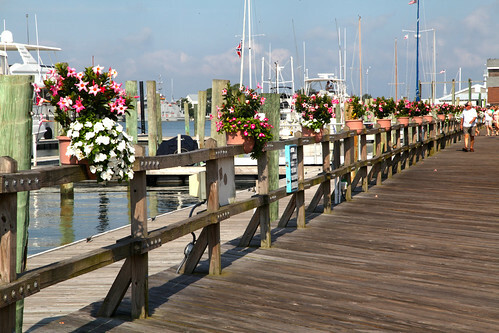 This was simply an amazing trip and I can’t thank the people of the Crystal Coast enough for helping to make it happen. Here are a few more shots from our trip. Using my portable Dragonfly to stay on the spot, this thing would light up when big schools of fish went by. Bobby’s First AJ, but not the last!! 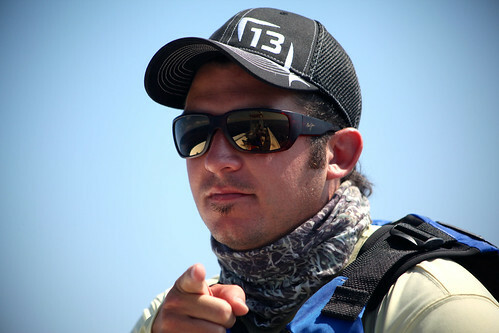 With his Maui Jims on Brooks could pick out his next fish. Another AJ set for release. 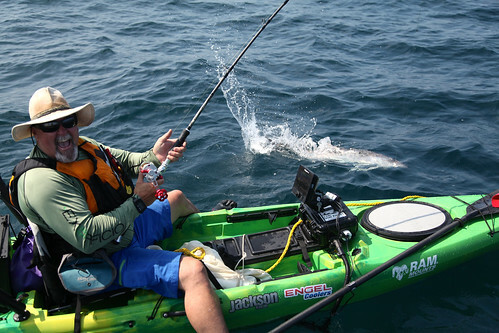 When the fishing is this good you give the last baits to the camera man Will. 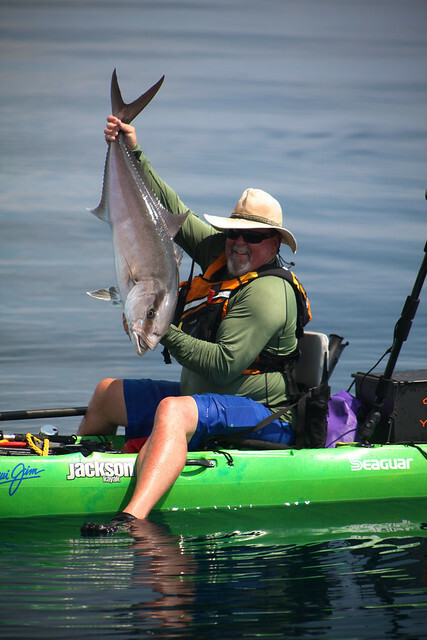 I want to thank once again the wonderful people on the Crystal Coast for making this trip happen, Bobby Brewer for putting it all together, Brooks Beatty for bringing the kayaks and being a great fishing partner, Joe Shute for finding the fish for us and of course all our sponsors for supplying the great gear and of course our fans because without you we have no show. 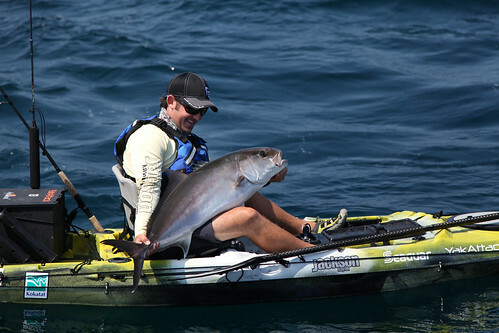 ← Amberjack Fishing off the Crystal Coast!